When Kerri Martin teaches kids how to repair bikes, they end up with a lot more than just a great ride. Ten-year-old America steps through the door of a cavernous building crammed with 600 or so bicycles in Asbury Park, New Jersey. She fills out a time card, dons a work apron, safety glasses and gloves, then begins wresting a tire off its frame. Asked if that&apos;s difficult, she replies, "I can handle it." America is cheerfully and confidently working toward her own two-wheeler, preferably in hot pink or orange, thanks to Kerri Martin, aka "the Bike Lady." 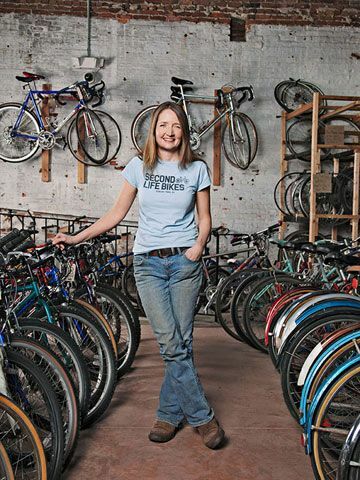 She&apos;s the force behind a youth-centered bike store where kids contribute 15 hours in the shop to earn a set of wheels for themselves. "There&apos;s no prerequisite," Kerri says. "Anyone who makes the effort can come." And come they do: Around 200 walked through the door last year. "The kids think they&apos;re just getting a bike," Kerri laughs. "But they&apos;re learning job skills and gaining a work ethic." The boys and girls—usually ages 12 to 18—are interviewed and then assigned a schedule of no more than two hours a day. Kerri, another two salaried full-timers and about 20 volunteers show them how to refurbish the donated or salvaged bikes to sell at the shop. "It's a fun place," America says, a testament to Kerri's philosophy of building bikes as well as fostering community. "I want them to feel like I do when I come in here," Kerri says, "as if they're walking into a garage that's their place too." The enthusiastic 41-year-old's love affair with bikes began 19 years ago, when she lived in Germany and rode everywhere. The New Jersey native transferred to New York City, where she continued biking to her job in finance, and began volunteering at New York's Recycle-A-Bicycle, which has a similar youth program. After 9/11, she took a long-overdue look at her life's direction and left the corporate world to work at Recycle-A-Bicycle. Four years later, after she began working at a cycle shop in Asbury Park, she wondered if she could duplicate the "earn a bike" concept in the sometimes-gritty Jersey Shore town. So she invited three neighborhood girls to learn to fix bikes in order to each get one themselves. "From that day forward, it was kids telling other kids," Kerri recalls. In 2009 she opened Second Life Bikes. of mouth. Girl Scouts bring in used bicycles and learn mechanics. Big Brother/Big Sister pairs work jointly to earn the child a bike so they can ride together. And troubled youth can complete their community service requirement in the shop. Since achieving nonprofit status last year, Kerri has been dreaming about what's next: more formal training, welding instruction, nutrition classes and riding clubs. She glances around the echoing brick structure, bracing herself for the after-school rush. "Biking has changed my life," Kerri says. "You get so much freedom from it. I want kids to catch that feeling." Originally published in the July 2013 issue of Family Circle magazine.